North Florida Sandhill community, photo by Nancy Bissett. When children are nurtured and raised into adulthood, the ideal is that these people will then be able to take care of themselves and may provide benefit to local society and the world. Some benefits are easily recognizable, while others cannot be grasped by common perceptions. Each person is a member of the larger community and plays a part, whether as a president or as a janitor (the janitor could be the more important one). Each is especially important. Their presence and effect are undeniable, however minor they may seem. Let’s take this one step further. As conscious as we can be of planting (together) components of a plant community, we must be equally thoughtful of where we plant. The plants making up a community that we refer to as a “fresh water wetland” will most likely not thrive on the top of dry hill, and most won’t live on a wind-blown salty beachfront. If we can be more thoughtful of following nature’s guidelines, we will minimize the amount of energy, water and work needed to maintain our landscapes. … named for the characteristic plant species within them or for characteristic environmental features [e.g., pine rockland]. Native plant communities are also referred to as natural communities, native or natural habitats, native plant associations. Generally, native plant communities are the “floral” components of natural ecosystems. 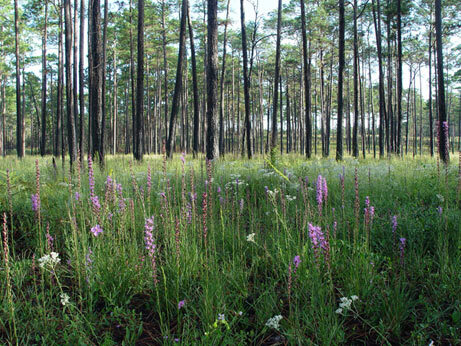 More than one classification system exists for Florida’s native plant communities. FANN uses one based on the 1967 Davis vegetation map. Florida Native Plant Society (FNPS), a statewide nonprofit with chapters in many counties, offers public field trips, programs and information about Florida’s native plant and native plant communities. FNPS is the oldest and largest organization of native plant enthusiasts, including gardeners and scientists, in the state. Florida Natural Areas Inventory (FNAI), a nonprofit dedicated to developing and maintaing a database of Florida’s biological diversity. More detail and scientific information on our Florida native plant communities can be found online in FNAI’s Guide to the Natural Communities of Florida, 2010 Edition.